The dog days of summer are upon us. It's too damn hot, but I'll take it. I'd rather put on a pair of flip flops than a pair of boots any day. 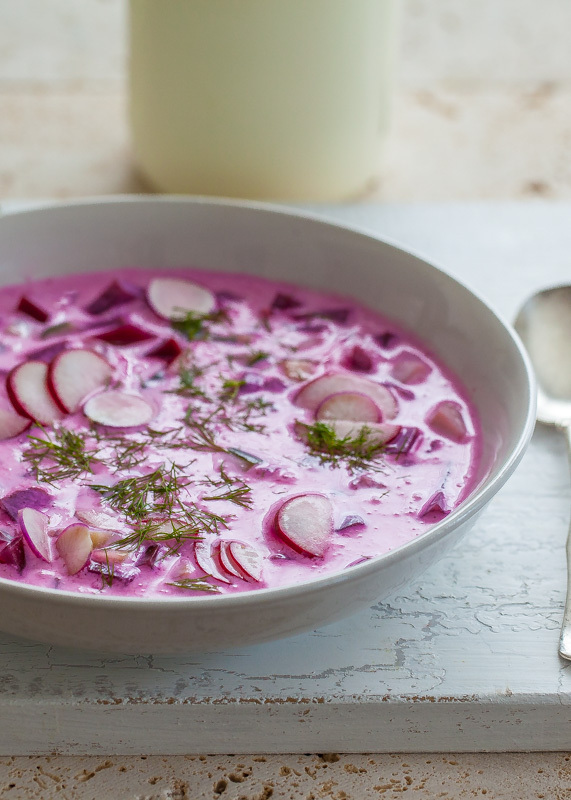 This soup with tangy buttermilk, crunchy cucumbers, and sweet and sour pickled beets hits the spot when you crave something refreshing and don’t feel like making much of an effort. The soup turns from pale pink to deep fuschia as the beets mingle with the buttermilk. Serve it with a slice or two of buttered rye bread and some cold, roast chicken, or a hunk of cheese. Stove not required. 1. Into a large bowl, spoon the sour cream. Gradually whisk in the buttermilk until the mixture is smooth. 2. Add the cucumber and beets to the bowl. Season with salt and lots of freshly ground black pepper, stir, and taste. Add more salt and pepper, if you like. Chill until cold in the refrigerator, or stir in a couple of ice cubes if you are in a hurry. 3. Ladle the cold soup into bowls. Sprinkle with the dill and radishes.